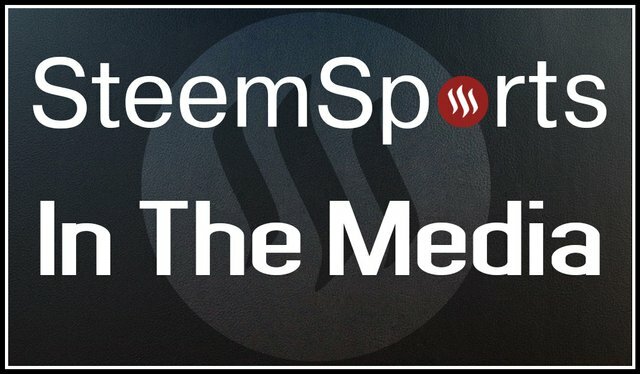 Steemsports CEO Update: In the Media - Cover of Coremedia.info Magazine! I am proud of the development team of @steemsports; led by our CTO, @furion, with the help of @pkaterra on front-end design and new dev team member Fred, a React specialist recently on-boarded to help us improve on our web-app. The team has worked hard to provide us with a beta product that is good enough to take to market as a showcase of things to come. 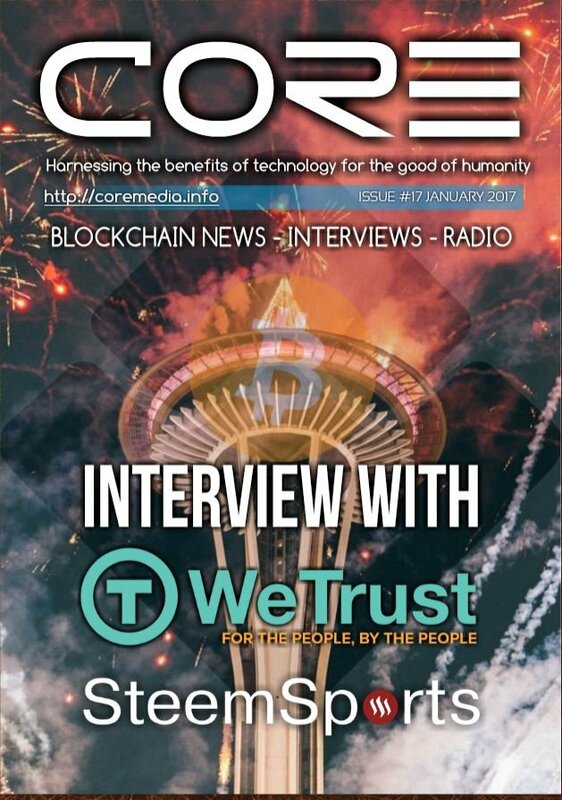 We "kick-off" our debut media exposure with a magazine intro and interview on coremedia.info and have several other media coverage opportunities in the pipeline. 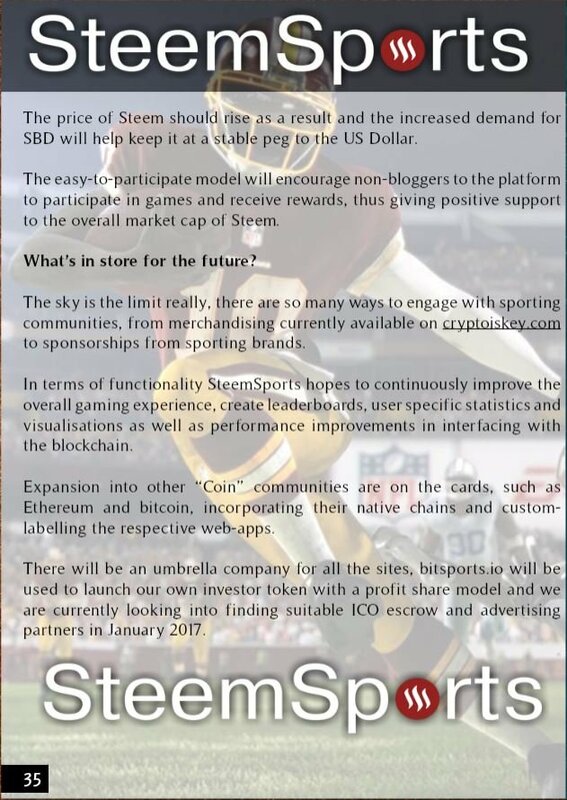 Not only are we advertising SteemSports, but in doing so we are also being ambassadors for the Steem blockchain and community. 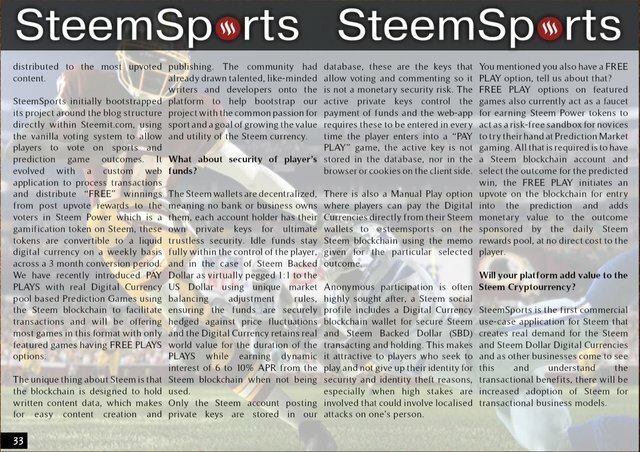 Unfortunately, at the time of release of the media article and prior to our announcement thereof to the community, the @steemsports project suffered a radical decline in whale support due to community division, with certain factions putting pressure on them to pull their support, causing our innovative FREE PLAYS model to come under fire. Our post rewards have dropped significantly to around 20$ per post which rendered FREE PLAYS useless and a public embarrassment due to the low FREE rewards pool. Furthermore, our writers have been reluctant to write games due to the lower rewards and potentially being targetted the same way as the whale supporters. FREE PLAYS are only effective if post rewards are around 200$ per post in future, but we still run the risk of negative community perception of high rewards if the current market sentiment carries through into the future. We have thus had no choice but to suspend FREE PLAYS and you will notice our posts and web-app indicate "PAY PLAYS" only. The liquid post rewards have been amended internally to 60% editor and 40% writer in an attempt to stimulate further games being published to keep our web-app populated. As of right now we have maybe one game on the web-app at any given time and sometimes none at all since the media article has been running. This model may be better supported by the community as writers and editors will be rewarded directly with the liquid reward, and keeping with the standard use-case of the Steem rewards model. It will also be easier to onboard new external players without the complexity of having to explain the Steem Power free rewards. 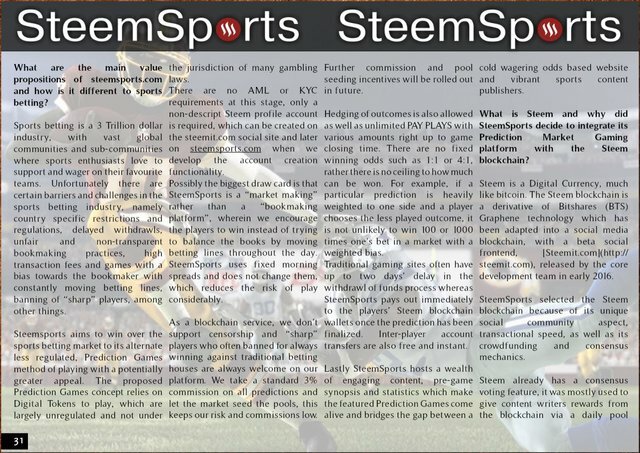 In addition, since a majority of the liquid rewards will automatically be paid mainly to writers, it will be a good incentive to onboard external sports writers who may bring their social communities with them to take part in Steem and SteemSports PAY PLAYS. For the success of the new model, we still need to maintain games within the rewards range of approx 80$ per post to stimulate writers and editors to be involved and to have some visibility on the main page to attract further writers. The development team has been working on version 2.0 of the web-app which will be ready for deployment very shortly, this version will be more efficient as we have cleaned up most of the sharded code. The new version however, no longer supports the "FREE PLAYS" model. There has been some call for the return of "FREE PLAYS" in recent comments from the community, and we can hypothetically re-introduce them again in a future version depending on sentiment and future sustainability of such a model. 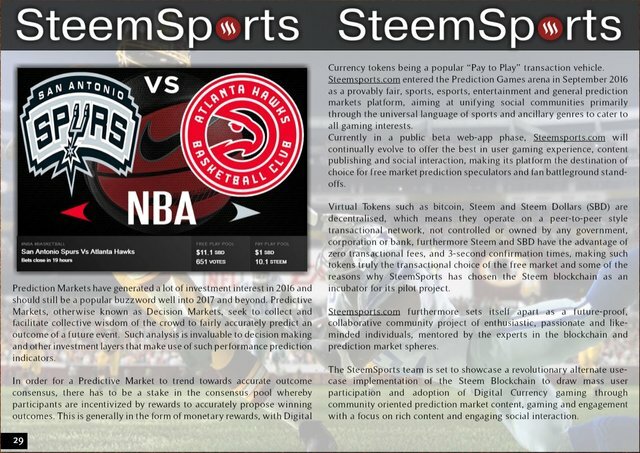 We hope you enjoy the read of the first media exposure we have procured for our project and for the greater Steem community. Please note: Our website is currently down for upgrade, it will be up very shortly. Our post rewards have dropped significantly to around 20$ per post which rendered FREE PLAYS useless and a public embarrassment due to the low FREE rewards pool. At times myopia is very strong within this community. It's unfortunate to see the best marketing Steemit had going for it become it's target. Thank you for your past and current support for our project, I also loved your parody post about post rewards, classic! Regarding those who have decided to attempt to take down @steemsports, I would say, "Forgive them - for they know not what they do." But they know exactly what they're doing. The funny thing (or the not-so-funny thing) is that they believe they are actually "saving" Steemit from "harmful" users. In reality, their actions are causing the most harm and this post is a perfect example of it. I may not agree with 100% of the things @steemsports does, but you/they have been a huge part of this platform and the first major test of the system. It's unfortunate that there are so many blind people who cannot see the value of that and cannot comprehend how these things work. Can I ask you to support this post?? It is to help Nolan our 15 year old witness everyone knows as - @theprophet0 - who needs a bit of help. I hope you do not mind this here, it is hard to message people privately esp. if time is of the essence. TYIA and keep up the good work!! Sure he is a core member of our team, I will upvote shortly! I figured you would help, TY so much. I know I have worked out with a friend another post is going up tomorrow, around 6 pm EST along the same lines to help him out too. Agreed "one for all and all for one" only together we are great. It's a redistribution scheme that worked!! Thanks for your support, we are experimenting with some changes in the upcoming weeks, unfortunately the freeplays is a target of much abuse and stress for us and we have lost whale support to be able to distribute anything worthwhile. Perhaps the whales can be encouraged to grow some back bone? It's not like there are thousands of voices crying out, I'm betting they couldn't get to one hundred. The 'draining the reward pool' excuse has been debunked. Is it only the opinion of a few that keeps all of us from the most popular thing on the platform?